Crude prices are $47.14 this morning after losing $1.20 (2.5%) yesterday. Prices have continued their losses today, shedding 45 cents since opening this morning at $47.49. Today’s price was the lowest opening price in nearly three and a half weeks. Combined, crude prices are down 3.74% from the price we shared yesterday morning. Refined products experienced similar losses. Diesel prices are $1.5873, down 1.84 (1.15%) cents since yesterday’s close. Diesel losses have accelerated this morning, after giving up just 2.81 cents (1.7%) yesterday. Gasoline helped lead the way on losses yesterday. Prices this morning are $1.5702, down 65 points (.41%) from their closing point yesterday. Prices gave up 3.63 cents (2.3%) yesterday. A deceleration of Chinese oil demand has helped to send markets lower. Markets continue to rely on high oil demand to outpace growing production. If demand tapers down, inventories will remain in place or rise, sending prices lower. Adding to the bearish sentiment, the EIA announced their forecast for September production in the U.S., with a 117 kbpd rise in production (the ninth straight month of production growth). Last week we said that East Asian instability would be bearish for prices. Now that North Korea has backed down from their threats, prices are…still falling. Why? While the East Asian region consumes more fuel than it produces, they are an important player in global economics. For that reason, the calming of tensions has sent the US Dollar higher, rising off their 2017 lows. Remember that the dollar and oil prices have a strong negative correlation, meaning that a stronger dollar means weaker oil prices. 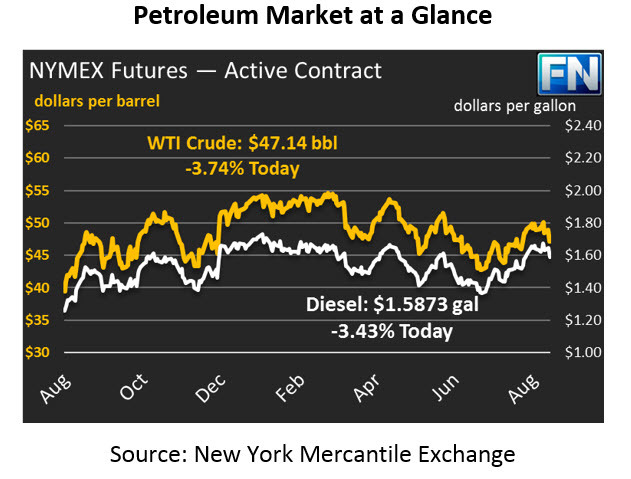 Changes in the dollar can often overwhelm oil fundamentals, which is why oil prices are still falling. Speaking of factors that overwhelm oil fundamentals, it’s appears many factors are doing that this year. Last week Andy Hall, known by many oil traders as “god”, announced he was closing his hedge fund after a series of losses. Hall is known for making $100 million in one year trading oil. He wrote a letter to his investors stating that oil fundamentals have been very poorly correlated with actual market performance lately – even with supply and demand coming into balance, markets have languished. He blames algorithmic trading systems, which use different calculations to drive the market. With markets destabilized by a constant “will they/won’t they” from OPEC and Non-OPEC countries, predicting fundamental trends is harder than ever. The main takeaway – no matter what price forecast you hear, take it with a grain of salt. Prices could plummet to $30 next year, or soar to $70, driven by a whole host of constantly moving factors.